Panini America’s ballyhooed 2018 Contenders Football arrived in hobby shops across North America roughly six weeks ago to a ready-and-waiting collector base that has spent the weeks since in a wrapper-ripping, Rookie Ticket-revealing frenzy. That’s certain to continue in the weeks ahead as the many Contenders completists work on building their sets, with one eye always on the set’s various variations and short prints. Three weeks back we started sharing preliminary information in an effort to clarify or demystify some of the set’s SP and SSP mysteries. You can check out our first update here, our second update here and last week’s update here. 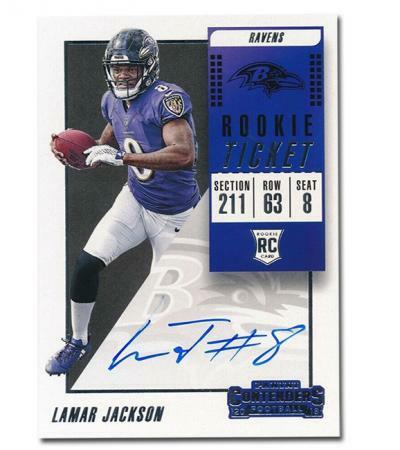 The list below details more of the SPs and SSPs featured in 2018 Contenders Football’s Rookie Tickets (black team logo) and Rookie Ticket Variations (color team logo). For 2018 Contenders Football, an SP indicates cards with a print run of 250 or less; an SSP indicates cards with a print run of 100 or less. Enjoy the list and stay tuned to The Knight’s Lance for continued coverage. And while this represents the last of our SP/SSP posts regarding 2018 Contenders Football, we have a bonus SP list to share. In honor of 2018 Contenders Optic Football releasing today, we’re sharing the list of SPs and SSPs from last season’s 2017 Contenders Optic Football. Enjoy the information and stay tuned next week when we’ll start sharing SP information on 2018 Contenders Optic Football. Thanks Scott, I will get on adding these!